and asks which of these elements are definitionally necessary to create a worker placement game. We’ll get back to the poll later in the article, but I’ll run through this definition in a bit more detail first. 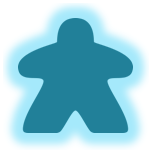 The “workers” in worker placement are both mechanical constructs (abstract units of being able to claim actions) and physical components (meeples or other tokens placed on the board to represent the act of claiming an action), and they may furthermore be thematic elements (people or other entities who are actually “working” to produce resources within the conceit of the game). A turn typically consists of placing one or more workers (hence the name!) on spaces, then performing the associated action. These actions might range anywhere from “get another worker” to “produce resources” or “spend resources on developments” or “get a few victory points.” “Claim the first turn in the next round” is also a popular action type, as we discussed in the last article series. Each round might feature an action draft, where each player places his workers, followed by another pass around the table of actually performing the actions; or the round might proceed to each player in turn, where one player places a worker and immediately performs the associated action, then the next player places a worker and takes the action, and so on. Often, once a worker has been placed (i.e., once an action has been claimed), nobody else can place a worker on the same spot, the “action blocking” that the BGG definition refers to. Sometimes, only certain actions are “blockable,” or certain actions might accept more than one (but still a finite number of) workers. In still other situations, the action draft is disconnected from the worker placement mechanic, and “get some workers and place them” is one of many things you might do with your turn. Finally, at the end of the round, once all of the workers have been placed and the associated actions performed, the workers are cleared from the board and returned to their respective players. Worker placement is therefore a mechanic that requires definite turns and does not operate well with simultaneous turns. There can be a lot of similarity between worker placement games and “role selection” games like San Juan and Race for the Galaxy. Both mechanics feature an action draft, during which each player claims and performs one action. But these games are not usually considered to be “worker placement” games for a couple of reasons. First, there are generally no physical workers to be placed, either as components or in the context of the narrative. Second, and more importantly, role selection games typically allow all of the players to perform the action associated with a selected role but give a bonus to the player who selected the role. For example, when the “Builder” role is selected in San Juan, everyone is allowed to build, but the Builder can do it more cheaply. In other words, because San Juan does not necessarily require a player to commit a worker to the Builder action to be able to build, San Juan is not considered a worker placement game. Crowdsourcing results: what is essential for worker placement? The number of workers is limited. This restriction in turn implies that the number of actions per turn is limited because a worker is required to claim an action. This item was by far the most commonly selected among the many options in the poll, with over 70% of the respondents saying it was required for a game to be considered a “worker placement” game. Limited workers (i.e., limited actions) is at the core of player decisions in worker placement games: a hypothetical Agricola where a player can gather resources, plant crops, expand the farm, and go fishing all on the same turn without having to decide among them is a much less strategically interesting game. There must be a limit on the number of times a single action can be drafted. With simultaneous actions, it’s impossible to enforce a turn-based drafting mechanic, especially when each drafted item can only be selected some limited number of times. Almost 53% of the respondents said that limited claims on the same action are essential for worker placement, and the similar percentage and mechanical connection make it likely that this element is highly correlated with the “turn order” element. The “turn order” element in conjunction with the “limited claims” element clearly illustrates the distinction between the worker placement and role selection mechanics: in Race for the Galaxy, all of the players do select their roles at the same time because there’s no limit to the number of times that any one role can be selected. Those three elements–limited workers, non-simultaneous turn order, and limited claims on the same action–are the only three elements out of sixteen proposed that more than half of the respondents agreed on. Therefore, in the following discussion of worker placement, we can use a slightly simplified definition: worker placement is a mechanic where each player has a limited number of workers that are used to draft actions according to a turn order. Actions are drafted by committing a worker to an action, and every action has some limited number of times that it can be selected. Of course, our definition says nothing about what those actions are, and they vary widely across the different games that use worker placement. Clearly, the nature of the workers, the other mechanics involved, and the thematic implications vary from game to game. But these three elements constitute a great core definition for what worker placement is. Crowdsourcing results: what is optional for worker placement? Ranking just behind the “top three” criteria are a group of four that are worth discussing, not as essential elements in worker placement but as common motifs that appear in worker placement games. Each of these elements were selected as essential to worker placement by about 40% of the poll respondents. You only place your own workers (no placement of other players’ workers). This is a good default assumption for many worker placement games: you control your workers, and the other players control their workers. But it’s possible to conceive of a game where you occasionally move someone else’s worker–thematically, maybe you’re bribing him or using mind-control magic or just establishing an alliance. The set of actions must be available for all players. Again, this statement is true for a majority of worker placement games but need not be true in all cases. Maybe your worker placement game has a “technology tree” structure where the “build airport” action is only available once you’ve constructed an oil refinery, which will be true for some players but not for others. Alternatively, maybe if you’re playing as one of the elven races, you get access to an entirely different set of actions as you would if you were playing as one of the dwarven races. Drafting must be done one-at-a-time. The wording here is a little vague, but I think it means that each player gets to place one worker, then the next player places one, and so on. For balance reasons, it’s probably best to start with a framework of “one at a time” drafting; in the context of the “limited claims” element, multiple consecutive draft selections can become very powerful. Action drafts are usually organized in circular rounds but could certainly be manipulated to give players extra picks or penalize them with later picks, possibly as a positional balance mechanism. At least two workers per player (to have turns). Instead of having “turns” as the poll suggests, two or more workers per player allows multiple rounds of the action draft to play out. To me, it’s not clear why this would be considered a requirement of worker placement games (and I suppose that around 60% of the poll respondents agreed with me), but having turns does allow players to react to other players’ placement and to establish small-scale, same-turn strategies. Crowdsourcing results: what are some possible misconceptions about worker placement? Here, I won’t discuss each of the eight other choices on the poll, each of which were identified by less than one quarter of the respondents as critical for worker placement games, but I will pick out a few that seem especially illustrative for formulating a good definition for designers to rely on. The workers have to be persons (from the theme). We’re big fans of games that consciously integrate theme with design, but doing so isn’t a requirement of a worker placement game, merely a nice touch. And it’s easy to imagine a worker placement game that does thematically integrate its workers despite them not being people (whether they’re ants in a colony or electrons in an atom or, my personal favorite, robots serving the ultimate intelligence). The actions must thematically be something that can be interpreted as “work.” Again, good theme/design integration is typically a sign of a good game but not an essential element of worker placement. In the hypothetical “electrons as workers” game, your electrons might be forming bonds with other atoms or being shifted between energy levels, which are tasks but not necessarily doing work. ALL actions must be limited (no unlimited actions). In fact, this element represents a part of the design space that it seems like more worker placement games should take advantage of. Limited chances to grab a particular action might be a defining characteristic of worker placement, but being denied the chance to make the best move for your strategy simply because someone got to it first can lead to dissatisfaction. Having a few competitive actions and also a few communal actions is entirely consistent with the worker placement mechanic and would probably reduce player frustration. Putting it all together: which games “count” as worker placement games? It’s obvious that Caylus (which arguably started the worker placement genre), Agricola (which is probably the best-known and best-regarded worker placement game of all), Last Will, and Tzolk’in: the Mayan Calendar are worker placement games because in all of these games, you have worker meeples or tokens that you place on action spaces, claim and perform the associated action, and in doing so prevent everyone else from taking that action in that round. It’s even more trivial that there are many, many games that do not involve worker placement, and a useful maxim is that while your game may in fact have workers that you place on a board, you do not necessarily have a worker placement game. Citizens in La Citta, armies in Small World, travelers in Tokaido, and settlements in Kingdom Builder do not perform action drafting functions and therefore are not workers in the worker placement sense. But there are some games that fall within some gray area, checking off some of the worker placement boxes but not the rest, or feeling like worker placement despite not really meeting the definition, or not having a classic worker placement arrangement despite mechanically meeting the requirements. Here, we’ll dissect two such games: Carcassonne and Bora Bora. At least at first, Carcassonne doesn’t fit the classic worker placement mold, and for good reason: it was designed and released before the worker placement mechanic gave rise to its own subgenre of strategy gaming. Dig a little deeper, though, and the legitimate case can be made that Carcassonne may count as a worker placement game. Each player does in fact have a limited number of workers (meeples) that are used in turns to draft spaces (occupy tiles). And each space can be claimed only once: you can never have more than one meeple on the same space, and you can never add a meeple to an area that already contains one (except through joining two established areas). Furthermore, most of the “optional” elements for worker placement are also satisfied in Carcassonne. I go back and forth on Carcassonne, and at least for the moment, I’m convinced that despite appearing to meet most of the basic worker placement criteria, Carcassonne is not in fact a worker placement game. First, making Carcassonne fit the definition requires stretching that definition a bit. In Carcassonne, you’re claiming areas on a board rather than abstract spaces corresponding to actions, which is not action drafting per se but closer to territory control. Second, and this disagreement reflects a slight shortcoming with the definition, “true” worker placement usually involves one draft per round, such that the workers are picked up at the end of the round and another draft occurs. When a space is claimed in Carcassonne’s “draft,” it is not relinquished until the associated area is completed, which may not be until the end of the game. Therefore, the example of Carcassonne inspires a quick modification to the earlier definition: worker placement is a mechanic where each player has a limited number of workers that are used to draft actions according to a turn order. Actions are drafted by committing a worker to an action, and every action has some limited number of times that it can be selected. Workers are retrieved once all of the actions have been completed so that a new draft can occur. What about Bora Bora? If Bora Bora is in fact a worker placement game, then the form of the “workers” is unconventional in that they’re dice (where their roll limits which actions they can be used to draft) rather than static meeples. But if we’re willing to consider dice as workers (and nothing in the revised definition says we can’t!) then Bora Bora is a textbook example of worker placement. In each round of Bora Bora, each player rolls his dice and then selects from among the actions that the dice say he’s allowed to select, then the next player does the same, and so on. There are limits on how many times each action can be selected; this limit is not 1 (a restriction that we deliberately did not include in the definition) and changes according to the number of players, so “hard” action blocking does not occur. That’s actually a strength of Bora Bora–as Alex will talk about in a later article, action blocking can be one of the major sources of dissatisfaction in worker placement games. Finally, once each selected action has been completed, each player picks up his dice and rolls them again to start the next action draft. Starting from BoardGameGeek’s thorough but perhaps too-restrictive definition of worker placement, we’ve gone through what other gamers, designers, and design analysts think is necessary for a game to claim that it uses a worker placement mechanic and arrived at a simple, workable definition that does a good job of including games that definitely pass the worker placement “eye test,” excluding games that definitely fail it, and sorting through games that might be a little ambiguous. Next, Alex will describe some examples of games that have implemented worker placement in particularly interesting or influential ways, and discuss some of worker placement’s shortcomings and how to address them. But let’s be serious, I rarely have the urge to share my thoughts on the Internet, but since I just found out about this blog and it suprised me pleasantly (with the variety of topics and quality of what’s presented), I guess I’m hungry for discussion. If you haven’t already, I suggest you try out Orléans (2014), it’s a heavy-duty worker placement mechanic with distinctive worker roles/professions which do not agressively block play space of other players, but the game is beautifully presented and very competitive. It’s also classified as pool building because you build the worker pool and then get to draw a random subset each turn with which you have to minmax your activities. I sincerely don’t believe that action blocking is essential for worker placement. As a matter of fact, action blocking should be considered a separate game dynamic that simply provides a theater for direct interaction and action superiority (you could also call this ‘abstract area control,’ because these action spaces are typically represented as areas on the board). Worker placement mechanic IMO not only helps at silverlining its game’s theme, but it also provides an elegant approach to book-keeping that’s easy to understand by women and casual consumers in general. Think about it for a bit and how it helps modern board game design proliferation. AFAIK it’s the second best operative mechanic, right after deck/pool building. I agree that action blocking as such is not a requirement for WP, and I think it’s the weakest part of the BGG definition. This might be a semantic distinction, but I think there’s an important difference in true “action blocking” and a more broad “limit on the number of times an action can be selected.” You’re exactly right that no action blocking occurs in Orleans, but there are limits to the number of times each action can be selected, so Orleans does fit that broader definition that we propose toward the end of the post. I’m completely with you in preferring implementations of WP that don’t rely on action blocking, but I think this paradigm is still evolving and only describes a small subset of WP games, at least as of the end of 2015. Just started reading this website. Great stuff. Love it! Thank you! We’re always thrilled to hear that you enjoy it! The WP concept is used loosely as in Troyes, with Meeples actually fulfilling certain positions both around the town (vis-a-vis professions) or in the various buildings. Role Selection, as you mentioned comes clearly into the fore in such games as Twilight Imperium. Shadows Over Camelot takes a curious turn in this regard in that certain tasks may accept only one “worker” ~ in this case a knight, while others support many members of the Round Table. I like where you’re going with this–there does seem to be an interesting and perhaps unexplored design space where workers either can or must remain on an action space for multiple rounds. Maybe “chop wood” is an easier task to perform than “quarry stone” so the stone worker is forced to remain for an extra turn. In any case, I think it’s essential for worker placement that the workers are removed from their action space at some point so that these actions can then be drafted by other players. Manhattan Project (https://boardgamegeek.com/boardgame/63628/manhattan-project) is a game that I can’t see described as anything other than a worker placement game. Each turn, you either place a worker on one of the common action spaces (and any number on your personal action spaces) OR clear all your workers, so it’s possible and common for your workers to be on the board for multiple turns. Part of the game is timing your clear actions so you have workers available when other players clear their workers.